The campsite is located directly in front of the beautiful beach of “Su Tiriarzu”. Pitches are to a great extent shady thanks to the vegetation – the land is perfectly flat – and they are equipped with connecting plunge in accordance with EEC regulations. The campsite is equipped with camper service. 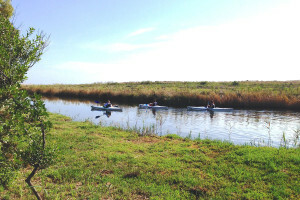 Peace and tranquility are the characteristics of the campsite, surrounded by nature, near a small pond. Bathrooms are always open and clean. For those who love sports there is a tennis court. Finally a restaurant pizzeria for those who love to taste special dishes typical of Italy. The perfect combination of comfort and practicality: a small house that has all that you need for a special stay. The bungalows are of recent construction with good insulation, each of them can accommodate 4 persons divided into one double-room and one room with bunk bed. The kitchen is equipped with sink, cooking top, fridge, table and chairs. An external veranda with table and chairs gives you the possibility to admire the beautiful sea of Sardinia. Simple but very accurate and functional. Available from 2 to 5 bed spaces (one double-bed one bunk-bed). The flat is equipped with all comforts: living area with sink, cooking top, fridge, table and chairs; private bathroom. The simple relax in the campsite, in the shady hammock by the trees is synonymous with relaxation. For those who love sports in the area near the campsite there are a lot of activities to enjoy: mountain bikes, canoes, trekking, kite surfing and diving. The white sandy beach is 3 km long and totally public, ideal for children thanks to the shallow water. If you love camper holidays, Ermosa is an ideal place to enjoy a good time with efficient services. 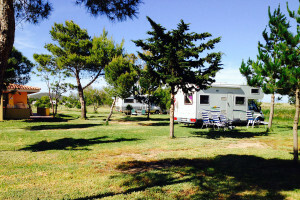 Camping Ermosa is located in one of the most beautiful areas of Sardinia. 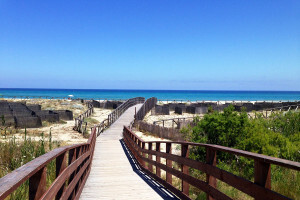 Posada is a few steps further, connected with cycle path; the campsite is directly in front of the wonderful 3 km long white sandy beach of “Su Tiriarzu” awarded “5 Vele Legambiente” as one of the best beaches of Italy. Easily accessible for all who come to Sardinia by ferry of by plane. The campsite is 40 minutes from Olbia and it takes only 10 minutes to get to Budoni and San Teodoro. A small village perched on the hilltop. The amazing view from the castle shares the surrounding plain and the sea. Posada is full of charm, a medieval town rich of history and tradition. In La Caletta there is one of the touristic ports of Sardinia, where in the evening some markets are organized and you can find a lot of restaurants and pizzerias. One of the most famous locations in Sardinia. It boasts some famous discos, in the evening there are small markets in the lanes in the center. They are welcome in the campsite. Near the campsite there is a Dog-Beach where they can stay and take a bath with you.